Really great talent has been shown by an 17 year old American teenager Zac Sunderland who has circled the world taking a little more than a year time and now holds the record for Youngest Sailor to conquer the world. 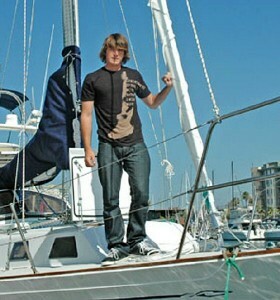 Zac Sunderland who started from Marina Del Rey, California last June has gone throughout the world with his Yatch, alone. Zac says he faced tough times in the middle of the journey with his Yatch breaking up, storms and also a threat from Pirates. He calls with Confidence that He never gave up on his journey. So young but greatness achieved, this is what said by people throughout the world on Zac sunderland’s journey. He said he had learned a lot about the world during his travels. “In other countries, 13 people are living in a dirt hut and when you meet them, they’re the kindest, most generous people,” he said. Though he was on the journey alone, he had communication with his family through satellite links and also did meet up his father on his route places.